Any one else struggle with time? That fleeting thing that whizzes by at breakneck speed past days, months and years. 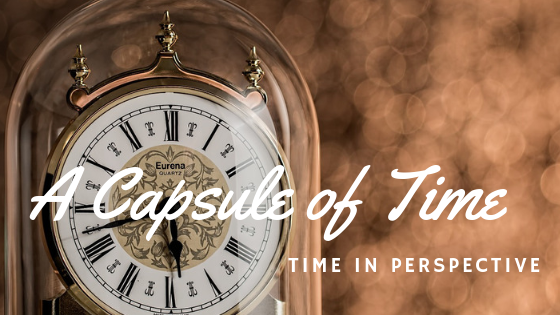 Only by gazing at the Timeless One will we fully appreciate the capsule of time we are given and reign time into its proper perspective. We micro-manage time with intensity. With day planners in pocket phones that never leave our sides, we organize time for work, family and recreation. We divide our time into minutes, hours, days, months and years. Sensing the fleeting nature of time, we pack every moment with busyness. Life goes fast, too fast! “I don’t have time!” are words that echo often throughout our culture. We postpone the things that should be done for what must be done! If we experience even the years of Moses’ life and measure them against eternity, it would be like the tiniest capsule floating almost invisibly in an endless ocean. Time is the most precious of all commodities. If I lose all my wealth and financial resources, there is opportunity to regain some portion. When health fails, The Healer stands close; heaven’s reality holds neither sickness nor death. If I lose even the closest ones I love, the hope of being reunited in eternity sustains me. Time is the only commodity never to be regained! This moment replaced by the next — both instantly gone! We stir with an awareness of more! For surely we were created not for fleeting moments but everlasting days. Every part of creation is affected by time — everything! One glance in the mirror at my deep wrinkles and laugh lines and the crown of thinning grey shouts, “Time is passing, girl!” Youthful subtle skin thins, bones ache, eyesight dims, memory comes and goes. Hide it? Ignore it? Excuse it? Nonetheless, time wears through the most resilient, defying restraint. All of creation succumbs to its influence. Because our minds cannot fathom anything apart from what we know, it is impossible to perceive Someone, the self-existing God, beyond time. Time is an earthly concept defined by multiple terms of measurement: decades, centuries, millennium. Time-words define our time, not God’s, because He is both within yet beyond all expanse of time. God has no beginning and no end. He has no past and no future living in the ever present now. In fact, He inhabits beginning and end simultaneously. Now that exceeds comprehension! The only One expanding beyond all scope of time is God; He alone is absolute everlasting! Because mankind was created in His image, we too were made for timelessness. is for mankind a tragedy of huge proportions. We live in this tension of time! Its deep significance, yet fleeting nature. Time has intrinsic value, uncontainable essence. So how do we best value time? The obvious is to not waste it. Yet, we all have “time-wasting” pursuits. Television, computers, Facebook top the list of many. Less obvious perhaps are procrastination, fear, daydreaming and indecisiveness. People and relationships are the most significant endeavours that should occupy our time. Because most of our days are spent in the workplace, create opportunities for deep and caring relationships with colleagues. Family will NOT always be there, as we sometimes perceive; seize moments to love and invest in close and distant relatives. Friendships take time to develop levels of trust and commitment that speaks mutually of love and value. People are the only “things” we actually can take to heaven! What about time for the greatest relationship of all — the one between us and the Lord? Is there time for prayer, reading and silent meditation of scripture, study of God’s character and nature, or serving Him by serving others? A young man told me once that he actually liked funerals. Astonished, I asked why! Early on he recognized that funerals brought him face-to-face with the shortness of his own life. A wise young man, I think! It is neither in the beginning of life nor in the fullness of busy days that we come to realize that faith in Jesus Christ is not optional. Christ is the only solution to the fleeting nature of life on earth. In Christ “God’s eternity and man’s mortality” collide. Christ acquired the great victory for man’s dilemma with time! and the law gives sin its power. We must all remember and view with brevity the limited time we have before we the leap from numbered days to limitless eternity. Today God extends His irresistible invitation. Death should never be “normal”. It pushes against all we are created and destined for. Thanks to Christ and the cross death never has the final word! Today is the day to secure your place in eternity! Thanks Joy…. How can you tell I’ve been teaching a Theology class??? Every little thread we follow toward God is so much wider and more powerful than we can comprehend.